1. You can go to > List > Subscribers Filter. 2. At the next page select “Filter” option. 3. 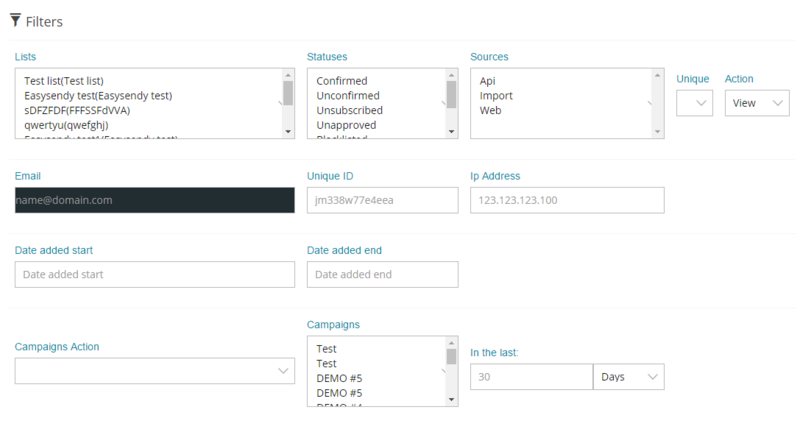 Now, you can filter all your subscriber from all your list, for this you can choose the List Name, Status, Sources, Unique ID, IP Address, Campaigns Action, and Campaigns. 4. From “Action” tab, present on the screen you can choose the type of action filter which you want as confirm,blacklist,disable etc. After, selecting all field click on “Submit” icon present on below screen. 5. Then, you will see all the details appearing below the screen of same page. This feature inside EasySendy Drip (or EasySendy Pro) is quite useful to filter the list of desired email subscribers and then you can perform required action.